World War Two has always been a popular topic in Year 6, and with such a huge amount of 9-11 year old fiction set in this time it is never easy to choose which book to use! Do you go for a classic like Goodnight, Mister Tom; a simpler read like Friend or Foe; or perhaps one you read yourself as a child, like Carrie’s War or The Silver Sword? All are, undoubtedly, excellent books in their own right, but I have always struggled in the past to either do them justice in the time available or to make them relatable to the children in my class. 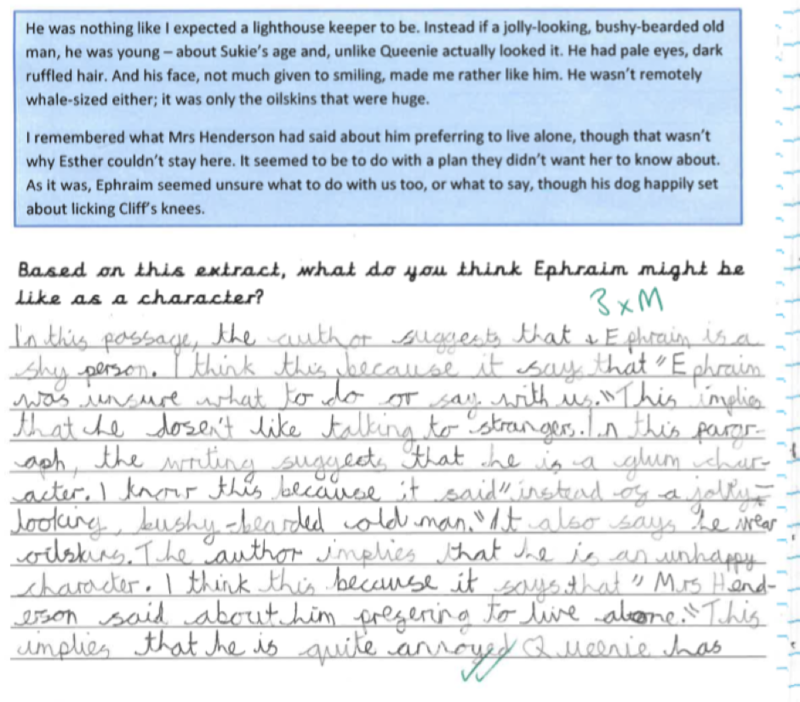 However, this year, Reading Teachers=Reading Pupils came to the rescue with Emma Carroll’s Letters to the Lighthouse. Since the book was only released in 2017, no children had yet read it; and, in addition, the tone used and characters described in the book felt more accessible than previous texts I had used. The characters were funny, flawed and… real! In addition, Carroll’s influences in modern day were also clear – enabling the children to independently identify and explain comparisons to their own lives. We used the book as the basis for all of our literacy teaching: reading, GPS and writing, and our topic areas were all based on WW2, so the children were fully immersed in the period. 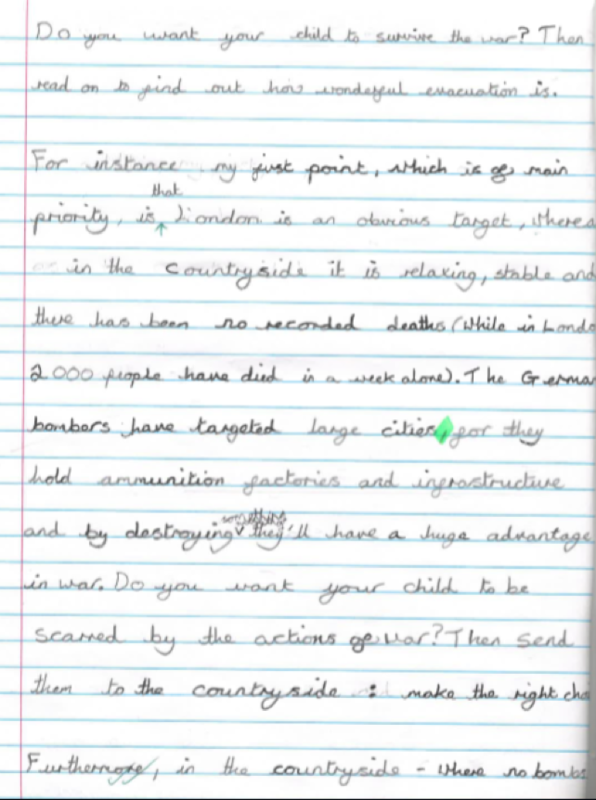 We began by looking at the chapter titles: children were given a list of them and were asked to choose one and design their own propaganda poster for it. Following on from this, we began to read the book and re-wrote the opening section, with the events following on from the cinema, from Sukie’s point of view. Next, we moved onto non-fiction writing, writing a letter to Mrs Bradshaw persuading her to evacuate her children to the countryside. 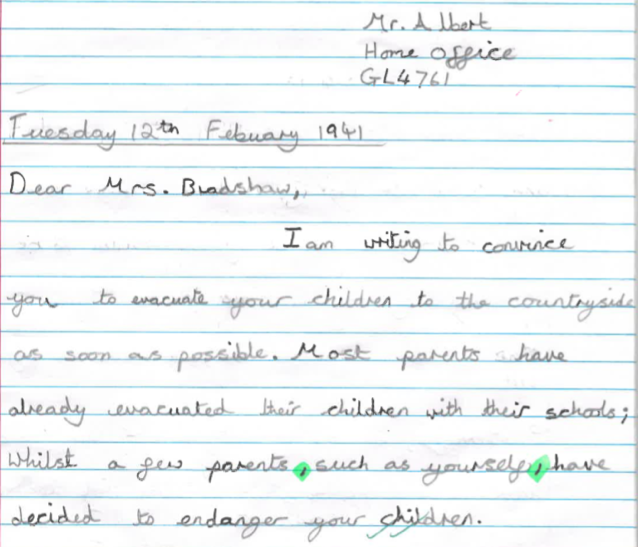 Children had to take on the role of working for the Home Office and consider how parents would most easily be persuaded. 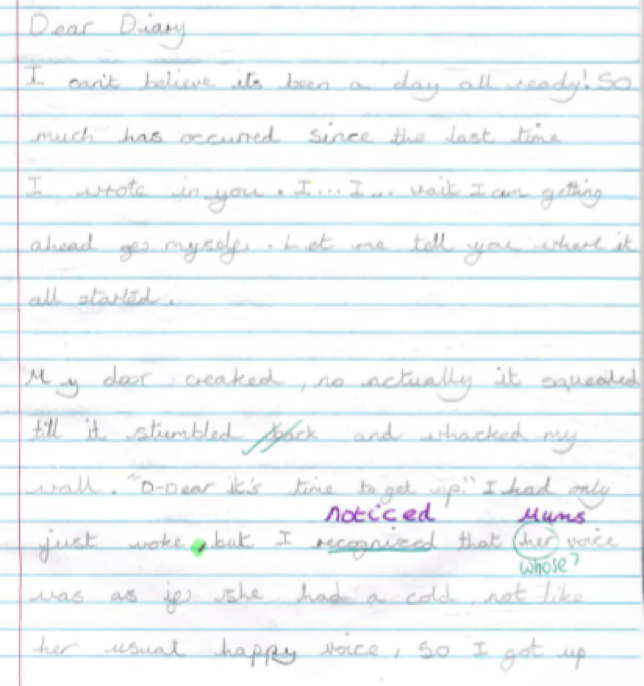 The next obvious piece of writing to do was a diary entry of the first day of Olive and Cliff’s evacuation. We had also been studying evacuation in history, and so children relished the opportunity to put themselves in the position of an evacuee. 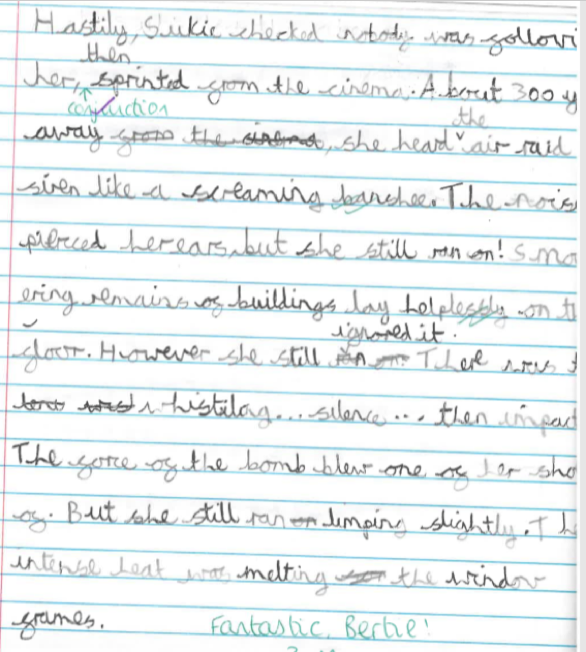 We moved onto narratives next, and I wrote a short suspense story about a mysterious letter, using characters from the book. The children spent time studying the language and structure of this story, before planning and writing their own short story, also based on a mysterious letter of some kind. Many children jumped at the opportunity to create their own code as part of their story. 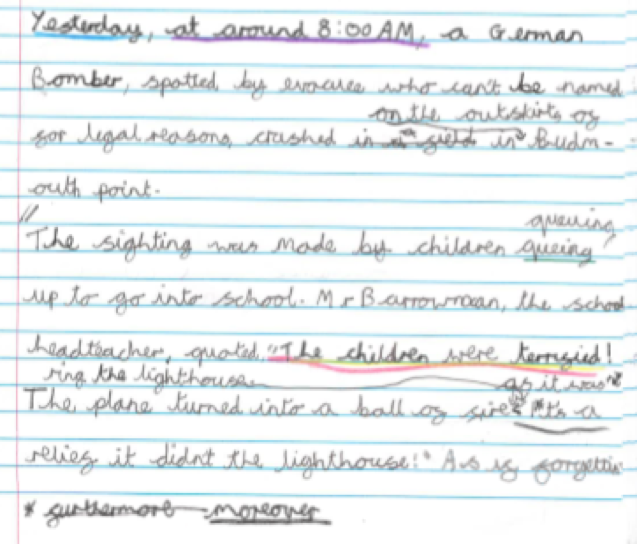 The German plane crash was an obvious opportunity for a conscious alley, which then led us into writing a newspaper article capturing the different views on the event. Having moved away from the traditional ‘Guided Reading Carousel’ like many schools, we embed all of our reading as part of our literacy. 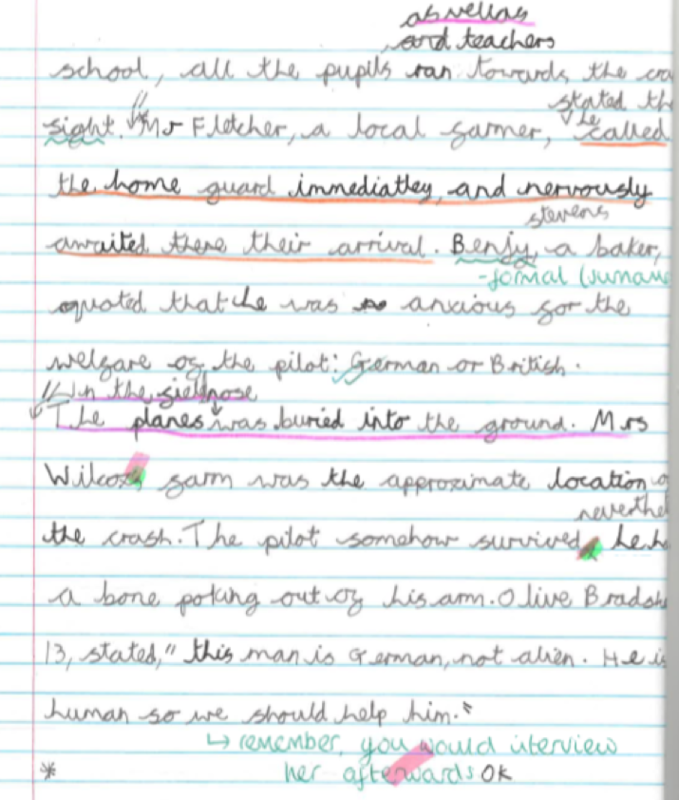 During this term we focused particularly on characterisation, especially in the context of 3 mark SATs style questions. We completed detailed analysis of the descriptions of Queenie, Olive and Ephraim. Finally, the continuing theme of refugees throughout the book really enabled us to make links to current affairs. We spent a lot of time discussing the Syrian Refugee Crisis and debating the many issues surrounding it. 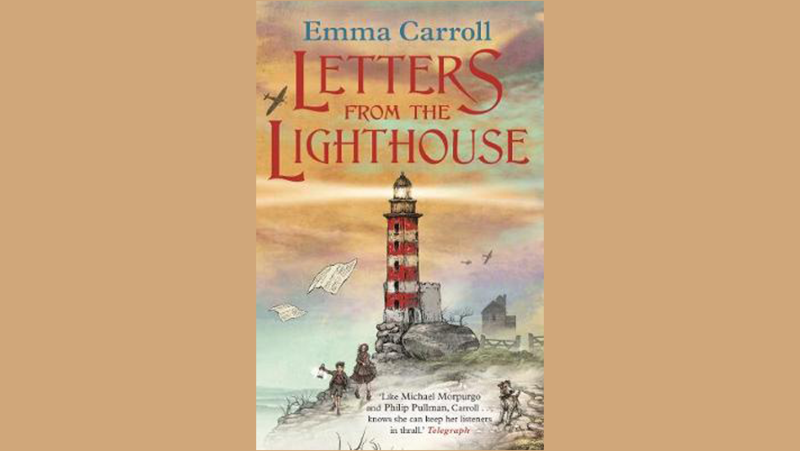 By the end of the term, there was no doubt that the children had engaged more with ‘Letters from the Lighthouse’ than they had with any other WW2 text I have covered in the past. I think this was largely because it felt manageable to them, whilst also offering a challenge – both in terms of the writing quality and the thought-provoking content. Once again, RT=RP successfully shared a book that was easy to use in the context of teaching reading and writing, but (most importantly) also inspired a passion for literature in the class and enabled us to start the academic year in the way we intended to go on: a class of readers.